Michael Ascher, M.D. is a board-certified psychiatrist who serves as a Clinical Assistant Professor at the University of Pennsylvania. Dr. Ascher uses a holistic approach to treat anxiety, depression, substance use problems, Adult ADHD, stress management, work-life balance, career and life transitions, and issues central to the creative process. I had a fantastic experience working with Dr Ascher. He is compassionate, available all the time, prudent and highly skilled. Dr Asher has a great and engaging patient approach and has great pharmacological knowledge. Dr. Asher provides the highest level of compassionate care. He is incredibly intelligent and has a kind and senstive way about him. I recommend him to many of my patients and everyone enjoys working with him. Over the past 3 years I’ve had the pleasure of collaborating with Dr. Ascher in the care of several clients. He is an active, enthusiastic, well-published clinician who is eager to promote the field, educate the public, and reach out to fellow therapists. He is the very embodiment of a flexible, open, curious, and kind clinician, passionate in his practice and a blessing to those he treats. I can think of no higher praise. Michael Ascher is one of the most talented psychiatrists I have come across to date. His professionalism is matched only by the compassion he shows his clients. His expertise in treating addiction makes him unique in the field of psychiatry. Using contemporary, evidence-based strategies and medically assisted treatments, my clientele has been fortunate to benefit from his expertise. Without reservation and with the highest of regard, I recommend his services to you! Dr. Ascher is a highly regarded and effective psychiatrist. I always feel confident referring my patients to him; he has a unique combination of skillfullness, expertise, responsiveness, straightforwardness, warmth, and ethical treatment. I do not say this lightly, as I am very careful when selecting a psychiatrist for my patients. I recommend him without reservation. Dr. Ascher is already blazing a remarkable trail of accomplishments in the first decade of his professional career. He is well on his way to becoming a highly recognized writer, teacher, clinician, and thought leader in addiction psychiatry. I coordinate care with Dr. Ascher for several patient and refer challenging cases to him often. I have consistently been impressed with his professionalism, knowledge, responsiveness, and interpersonal skill. Psychiatry is fortunate to have him among their ranks! Indeed, the world is fortunate because his excellent treatment of people dependent on substances undoubtedly makes the world a much safer place for all. Dr. Ascher is a dedicated physician and an advocate for his patients. I have enjoyed collaborating with him on some very difficult cases. He is readily available to patients, families and the care team. Dr. Ascher is an amazing doctor. He is always willing to go the extra mile for his patients which is why he is universally admired by both his patients and doctors alike. Dr. Ascher is a wonderful colleague. He was well known to me before we associated professionally. His reputation as a caring, compassionate and thorough clinician is greatly appreciated and respected by the literally hundreds of colleagues he’s collaborated with. Dr. Ascher is compassionate and a wonderful and involved colleague. He never “gives up” on anyone regardless of their suffering and treatment response. We share many patients because of our different specialties- and he is my go to referral for addiction psychiatry. He is non-judgemental and is both warm and professional. I highly recommend him for anyone with any type of issues but especially addiction illlnesses. This doctor truly has a wide range of experience and practice, as well as specialties and special interests. In addition to his impressive training and interests, he also has great interpersonal skills and a friendly constitution. It’s not a surprise that this doctor is a well respected faculty member at the University of Penn and holds a very successful private practice. Dr. Ascher is one of the leading addiction specialists, and I am comforted when I can refer patients to him. Not only is he exceptionally skillful, thorough, and reliable, he has a unique ability to empathize with patients in a way that supports their recovery. Thank you, Dr. Ascher, for the great work you are doing for this community! 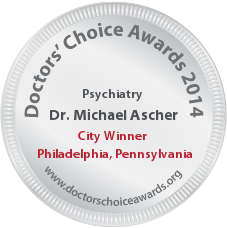 Dr. Ascher is an excellent psychiatrist and he brings care and compassion to his practice. I am honored to have him as a colleague and mentor and look forward to continuing working with him for years to come. Dr Ascher is at the top of my list for drug and alcohol referrals for medication management. As an Addiction Psychologist myself in Philadelphia and the Main Line, specializing primarily in the addictive disorders, about one third of my patients need to be followed medically for detox, withdrawal or craving medicine. Michael Ascher takes adequate time to assess our patients, he cares deeply and he is very available often calling and texting with amazing response time. He is laid back but super knowledgeable. I recommend him highly. 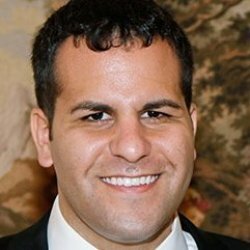 Jeremy Frank PhD CADC Addiction Psychologist and Certified Alcohol and Drug Counselor in Philadelphia. Dr. Michael Ascher embraces a calm, collected approach to his everyday practice. This is reflected in his gentle and supportive reassurances to patients, trainees, and colleagues. His tranquil, soothing demeanor is contagious. I believe he will continue to be one of the most prolific writers and innovators in our field. Dr. Ascher is an exemplary psychiatrist, teacher, and mentor. He is intelligent, thoughtful, and perceptive and I hold his advice on clinical and workplace matters in the highest regard. His supportive nature, sensitivity, warmth, and enthusiasm differentiate him within the medical community. I would recommend him without hesitation and give him my highest possible recommendation. Dr. Michael Ascher is dedicated to not only providing exceptional care to his patients, but when indicated also helping them find collateral treatment providers for a comprehensive approach. He makes it a point to work closely with other providers in order to provide optimal care to the patients. 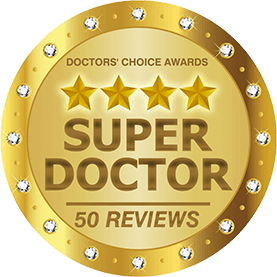 Dr. Ascher’s devotion, professionalism, and expertise has earned him the respect from colleagues and patients that make him the ideal candidate for Doctor’s Choice Award. Dr. Ascher is a consumate professional. He is the most published author of psychiatric literature that I have the pleasure of knowing. I have worked with Dr. Ascher and know him to be an excellent clinician, researcher, and educated. Dr. Ascher is of the highest calibre, and a true model to the profession of psychiatry. Dr. Ascher is an extremely conscientious and responsible physician who is appreciated by his patients for his calm and kind demeanor. His capacity to develop sophisticated and comprehensive treatment plans for patients with co-occurring issues is outstanding. His passion for psychiatry, psychotherapy, and family work is truly unique. Dr. Michael Ascher is one of my most trusted colleagues. He is accessible, funny, thorough, thoughtful, and really takes the time to get to know his patients, something that is a rarity in psychiatry these days. We have worked together in treating multiple mutual patients, and I have enjoyed our deep-rooted collaboration in these cases. 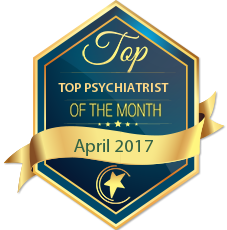 Dr. Ascher is a smart, kind, compassionate psychiatrist who I have had the pleasure of collaborating with over the year with a complex case. I would not hesitate to refer other patients to him, because aside from his inviting manner, he is innovative in his approach to more difficult situations. I appreciate that although he is very busy, he makes himself accessible to both patients and colleagues. I look forward to continuing to work together. Dr. Ascher goes the extra mile to ensure that he provides world class treatment. He is truly dedicated to providing the type of support that clients need to thrive. I have had the pleasure of successfully collaborating with Dr. Ascher on several patients presenting with highly complex issues. I have found him to be incredibly dedicated, compassionate, knowledgeable, and down-to-earth in his approach. Dr. Ascher appreciates the importance of the eco- system in treatment and is quite creative in his ability “think-out-of-the box” in creating systems of care in the community to support patients when necessary. I had the pleasure of being supervised by Dr. Ascher while on a dual diagnosis service. The unit census consisted of number of patient with active drug addiction with strong personality pathology. I was struck by Dr. Ascher’s ability to deal diplomatically with these patients and particularly their strong affects. He never compromised care with the most difficult patients. Moreover he worked with me extensively on not only the in’s and outs of addiction treatment but also reframing my conception of “the difficult patient” as most often stemming from treatable disease states. Dr. Ascher is a dedicated clinician, teacher, and colleague. His compassion, generosity, and willingness to go above and beyond for people have always been an inspiration to me. I have known Dr. Ascher for several years across a number of distinct environments including having him as my mentor and teacher when I was in medical school as well as working with him in the Group for the Advancement of Psychiatry. Dr. Ascher is an exceptionally good person whose interpersonal warmth and clinical acumen are apparent to anyone he encounters. He is kind and knowledgeable, two essential characteristics for any good psychiatrist. Beyond these qualities, it is clear that Dr. Ascher is quickly becoming a leader in the field. Dr. Ascher is a warm, compassionate and dedicated psychiatrist, with cutting-edge expertise in treating patients with addictive disorders using an individualized approach. I highly recommend him to patients seeking outstanding, sensitive psychiatric care. Dr. Ascher is an outstanding and compassionate physician. He is responsive to his patients, available to them quickly by phone more so than many other physicians. Dr. Ascher provides high quality care to patients and takes a family-centered approach. He is skilled in both medication management and psychotherapy. He has special expertise in substance use challenges and developmental life stages. I highly recommend him and will refer my own patients to him. A very smart, hardworking and amazingly knowledgeable psychiatrist who sees patients in their family and cultural context and has developed a wonderful team around him to give thorough and compassionate care. It is a great pleasure to work with him on projects and to read his articles and books. Dr. Ascher is kind, compassionate, inspirational and dynamic, all qualities that make him the leader that he already is. I have had the honor to learn from him during our collaborative writing projects in residency, and he remains a mentor to me and many other mental health professionals to this day. But, above all he is an outstanding academic clinician that translates clinical research into phenomenal, compassionate, and individualized patient care. I would highly recommend him to patients seeking exceptional psychiatric care. I have had the pleasure of knowing and working with Dr. Michael Ascher both during and after his residency training. I have always been very impressed with his passion, proactivity and dynamism. He is a prolific writer who has published numerous articles, co-authored books, written reviews and book chapters. He has always involved himself in numerous projects in writing and education. He is a compassionate and dedicated clinician committed to providing impeccable patient care, as well as a physician dedicated to education and lifelong learning. It is rare to find a doctor who is equally passionate about clinical work and education and administration, and who is able to excel in all these domains. Michael is someone who always goes above and beyond in every endeavor. He is a natural leader and collaborator. I have known Dr. Ascher since the beginning of his training and have had the pleasure of watching him accomplish so much so soon as a clinician, author, and committed citizen in the mental health community. He is a compassionate and caring doctor who incorporates multiple perspectives into his clinical approach. He is undoubtedly on his way to becoming a leader in the field. I have known Dr. Ascher for seven years as a resident clinician, as a researcher, as a writer and as a passionate advocate for the field of psychiatry. He is an enormously energetic and gifted clinician with a very broad range of interests. He is a caring doctor and an attentive and helpful colleague who always makes other people feel comfortable and at ease. He will without doubt become a leader in the field of his choosing, including that of family psychiatry. I am a clinical psychologist and I share patients with Dr. Ascher. He is a pleasure to collaborate with. He is extremely thorough in his evaluations, always available to his patients and colleagues, very professional and non-judgemental and incredibly knowledgeable. I highly recommend him. Dr. Ascher is an exceptional psychiatrist who believes in treating the whole person, as opposed to putting his focus solely on medication. He is sensitive to the individual needs and differences in his patients which helps then feel heard and understood, which is a common concern that causes some to avoid psychiatric services due to negative past experiences. He takes great interest in the well being of his patience and stays in regular contact with both the patient and his or her other providers to ensure that they are getting the best possible care. Dr. Ascher is a brilliant and compassionate man with a rare set of attributes seen these days. He is hungry for knowledge and information that will help him in his work with patients and writing articles to share with all. He has been trained in several of the evidenced based protocols with a focus on the treatment of the Addiction disorders. If I had a family member needing help for mental health or addiction issues, I would send them to see Dr. Ascher. Dr. Ascher is a dynamic clinician/educator whose view of psychiatry is refreshing, exemplified by his recent publication “The Behavioral Addictions.” He emphasizes context of psychiatric disturbance which is sorely needed in contemporary practice. Family relationships and developmental processes are a core part of his teaching and practice. I am happy to nominate him for a Doctor’s Choice Award. Dr. Michael Asher is an outstanding young psychiatrist. He has special expertise in addiction psychiatry, is committed to providing excellent care for his patients and their families. Dr. Ascher is also a prolific writer and has published numerous articles on a variety of subjects in mental health care. As a practitioner, I have found Dr. Ascher to be both committed and creative in his clinical approach. He is genuinely caring and this is reflected in his relationships with his clients. As a colleague, Dr. Ascher is collaborative and helpful, consistently staying abreast of the most relevant developments in the field of psychiatry and disseminating this information in his articles. I have had the pleasure of working with Mike for the past year. He is a caring, compassionate, insightful physician who truly values the well-being of his patients. He strongly believes in engaging the family as part of effective treatment for the individual. Moreover, he allows the patient to be an active partner in their treatment. Mike is not afraid to think “out of the box” when conventional approaches are not yielding positive results. From a collegial standpoint, Mike is incredibly accommodating and epitomizes the definition of collaboration. Perhaps most importantly, Mike is always available to his patients from whom he is constantly learning how to be a better physician. I assure you that Mike is a worthy choice for this award. Its rare these days to meet a physician with a keen sense of what it means to be an empathic and connected doctor. To meet one who also has the knowledge base and experience to attend to complex psychiatric and medical conditions is an even more trying task. Dr. Ascher has both of these important qualiities. I have observed him interacting with individuals from diverse backgrounds with challenging issues and found him to be exceedingly talented in his ablity to understand and work with people to solve complicated life problems. We should all be so lucky to be helped by him. Dr. Ascher’s passion for understanding serves him exquisitely well as both clinician and scholar! Dr Ascher is a fabulous clinician as well as a creative and innovative thinker. 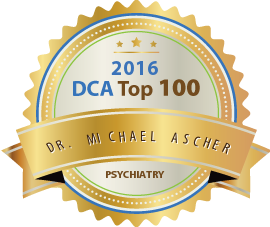 Dr. Ascher is a truly exceptional psychiatrist and a leader in the field of addiction. He is collaborative, warm, engaging, and deeply committed to individualized patient care – everything you could hope for in a clinician and colleague. It has been a joy to work with him, both in sharing cases and co-authoring articles. He has my highest recommendation for this award. I have had the pleasure of working closely with Dr. Michael Ascher for well over a year. He is an outstanding psychiatrist, highly skilled and trained and effective in treating even particularly complex disorders. 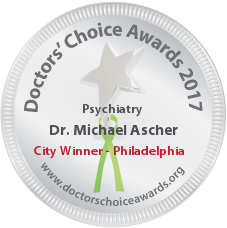 As important, Dr. Ascher is a dedicated, patient-centered psychiatrist, who goes the extra mile to provide excellent care for his patients. I would certainly refer a family member to Dr. Ascher. Dr. Ascher is not only a very well trained and talented psychiatrist, he also possesses something that only very, very few psychiatrists have: an extraordinary ability to remain calm, compassionate, and at the same time fully rational through the toughest situations. Dr. Ascher is also a highly respected academic physician with numerous original articles and insightful editorials to his credit, publications that reflect both solid knowledge of the scientific literature as well as much needed creativity in the art of healing. Dr. Ascher is extremely compassionate and cares deeply about each person’s unique story. He is highly motivated to seek the best care for his patients and advance the field of psychiatry in the areas of addiction and family systems. I have enjoyed reading his latest articles and look forward to his future work. Dr. Ascher is a wonderful doctor and friend. His kindness and warmth are felt immediately upon meeting him. Over the 3.5 years that I have know him, Michael has proved to be a great friend and colleague. Thanks to him in part, I have achieved professional and personal success of which I am very proud. Recently, I consulted with Michael on several psychotherapy cases and his advice was very helpful. His knowledge of psychopharmacology has helped me greatly in my work with patients. On a personally level, Michael has helped me through some difficult times in my life. I will always be grateful for his support. 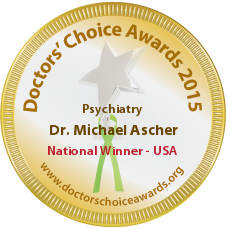 Dr Michael Ascher is extremely worthy of this award. Dr Michael Ascher is a remarkable, dedicate and intelligent psychiatrist. I have had the pleasure of knowing Dr Ascher for several years, and have been consistently impressed with his intelligence, thoughtfulness and empathy. He is also a very talented writer, who has successfully used his ability to further the field through research and publishing papers and reviews to guide others. Dr. Ascher is one of the most talented early career psychiatrist I know. He uses a holistic approach to treat psychiatric conditions including drug & alcohol related disorders. I have known Dr. Michael Ascher in a professional capacity for over a year. During that time, I have partnered with him in a volunteer role for NAMI. His demeanor in patient and family interactions is warm and admirable. He is conscientious and thoughtful, using an informed and holistic approach to conceptualization of his patients and their presenting difficulties. Dr. Ascher is generous in his clinical and academic endeavors, as well as in writing numerous books, articles and informative web entries to educate both professionals and the population at large. I look forward to having him as a colleague for years to come. Dr Ascher is a very diligent and dedicated Doctor Who is concerned first and foremost about the welfare of his patient but he is also interested in advancing psychiatry through his writing and research. Dr. Ascher is an up and coming leader in the specialty of psychiatry. He is a psychiatrist and addictionologist. He is a member of the Group for the Advancement of Psychiatry where he has focused on family interventions integrated into psychiatric care. He has published and regulalry writes clincal columns about family, culture, addictions and psychiatry in trade journals. I highly recommend him for a Doctors’ Choice Award. Dr. Ascher is an excellent psychiatrist! I had the privilege of working closely with him on the public affairs committee of our local branch of the American Psychiatric Association when he was based in New York City. I have read almost all his writings, which clearly reflect his passion for good treatment which incorporates family and psychodynamically-oriented therapies. It is always a pleasure interacting with Dr. Ascher. Dr. Ascher is a remarkable psychiatrist who views issues from multiple perspectives and develops both a broad and deep understanding. He is able to develop dynamic treatment approaches that balance medical, psychological and social needs while engaging with patients in a warm and compassionate manner. He shows the potential for remarkable and innovative accomplishment in the field. Dr. Ascher is an incredible psychiatrist and colleague. He is not only dedicated to individual patient care, but also to improving overall systems of care. He is able to effectively manage some of the most difficult cases with compassion and empathy. His perspective and integration of family systems care into his treatment models is remarkable. I look forward to future collaborations with Dr. Ascher. 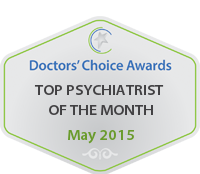 Dr. Ascher is an extremely caring, reliable and collaborative psychiatrist. He is a careful prescriber who believes in the utility of psychotherapy. I have thoroughly enjoyed treating patients with Dr. Ascher. He is a gem!